On the south west side of the Market Square in Melrose stands a two storey building made of red sandstone. A sign in the glass panel above the door identifies it as "The Ormiston Institute", and another immediately above reads "Roman Heritage Centre". For the avoidance of any doubt, another sign to one side of the door, probably much more noticeable to the passer-by, welcomes you to the Three Hills Roman Heritage Centre. What's in a name? Well we're not quite done yet, because the heritage centre's website prefers to refer to it as "The Trimontium Museum", which is the name we've used on this page. "Trimontium" was the name given by the Romans to the major fort (and surrounding settlement) they built at Newstead, a little over a mile to the east of Melrose. Trimontium was sufficiently important to be named on a map of the world produced by Ptolemy in the second century. 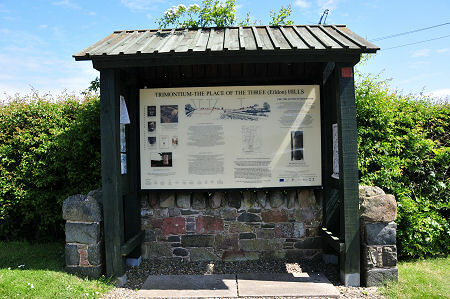 The name probably means "the camp of the three hills" or "the place of the three peaks" and derives from the three peaks of the Eildon Hills, which rise to the south of both Melrose and Newstead. In the centuries after the Romans finally withdrew to Hadrian's Wall, Trimontium and the surrounding settlement were quarried for cut stone to the point where little remained. So little, in fact, that by the middle ages it was generally believed that the remaining traces of buildings was all that was left of an abbey. One of the fields in the area even carries the name Red Abbeystead. In the aftermath of the 1745 Jacobite Uprising, Major-General William Roy was commissioned to survey and map Scotland. He was very familiar with earlier mapping (including Ptolemy's) and when he saw the Eildon Hills felt he must be close to "Trimontium". It took much later archeological investigation to tie down the site more closely. Today there is an information board and a memorial on the roadside near the site of Trimontium, but little or nothing is visible on the ground (especially under the healthy crop of cereals growing there when we last visited). Archeologists have been visiting Newstead for over a century. They have discovered traces of a succession of forts on the site, There were settlements or annexes on all four sides of the fort itself. Particularly striking finds have included foundations of a mansio, or official guesthouse, and a bathhouse, both believed to have been added during a major expansion of Trimontium in AD86. 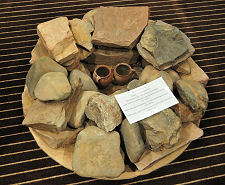 A dig in 1996 unearthed traces of an amphitheatre capable of accommodating between 1,000 and 2,000 spectators. 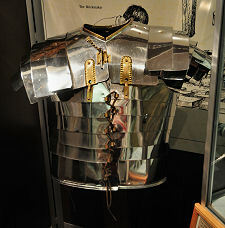 Excavations at Trimontium have also produced a particularly rich vein of military armour including ornate cavalry or sports helmets. The Trimontium Museum occupies a single large room in the Ormiston Institute and the corridor leading to it. This many not sound much, but the sheer number of artefacts on display is remarkable: as is the skill that has gone into displaying them all without making the experience overwhelming or confusing. What you find is a absolute treasure trove - in some cases quite literally - of relics from the Roman world. 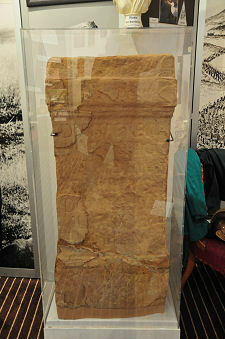 Much of what was found at Trimontium subsequently found its way to the National Museum of Scotland, but more than enough remains in Melrose to make a visit to the Trimontium Museum well worth while. Everyone will emerge with their own list of favourites. 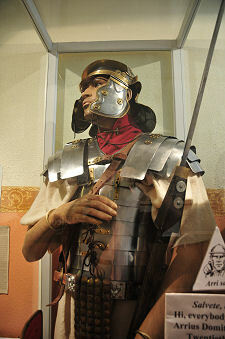 We were impressed by the life-size model of Gaius Arrius Domitianus, kitted out as a member of the twentieth legion, who greets visitors in the corridor. 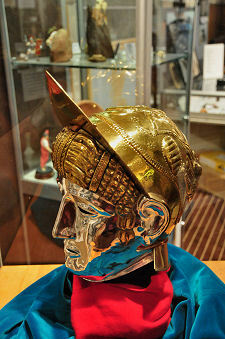 And no-one can fail to be inspired by the amazing highly decorated bronze cavalry helmet, complete with a recreated face mask. In some ways, though, the more domestic relics are at least as important and interesting. 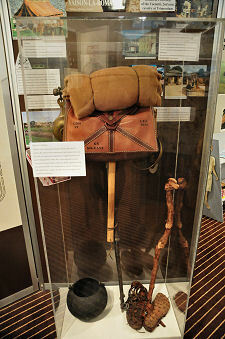 Displays of food and cooking equipment compete for attention with the marching kit of one of "Marius's Mules", the nickname given to legionary as a result of the heavy loads they were expected to carry while on the march. 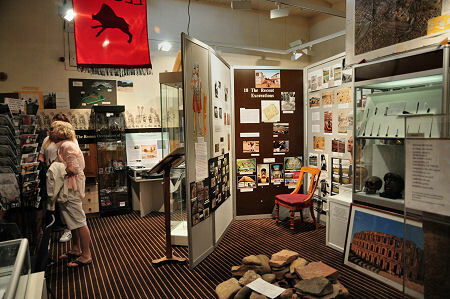 No Roman museum would be complete without displays of pottery and coins, and there are plenty of both. 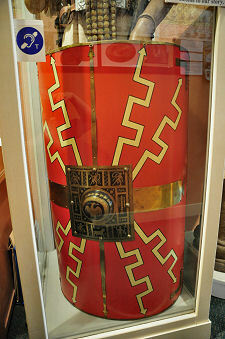 There are also displays of Roman glassware, plus a model of the fort at Trimontium and much more. 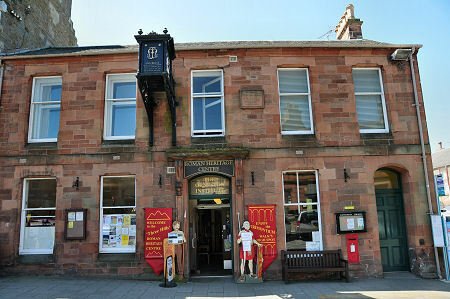 The Ormiston, Market Square, Melrose, TD6 9PN.